We all know very well that the tech giant Google’s well-known service and app, of course, I am talking about none other than the Google Calendar has become most wanted for many in their particular agenda. As it is the place where we usually add each of the tasks we have to do and do not want to forget. The tech giant Google’s well-known service and app, of course, I am talking about none other than the Google Calendar has become most wanted for many in their particular agenda. As it is the place where we usually add each of the tasks we have to do and do not want to forget. In this way, whether we are in front of the PC or if we carry the phone in our pocket, we will always be aware of all the tasks or events that we will have in the coming days. However, I am sure that many of you also receive invitations to a lot of events through the platform of the social network giant Facebook. Hence, next, we are simply going to show you step by step how to add all the Facebook events to your Google calendar. So, now without wasting much time let’s get started and simply explore the whole tutorial that we have mentioned below. In this way, we will have all the events organized in one place that are of interest to us that we will attend in our Google calendar. All assembled in a single place so that we are aware of all our tasks and events from the computer or mobile. To add Facebook events to your Google calendar, what we are going to do is take advantage of an extension that has been developed for this purpose. We refer to Checker Plus for Google Calendar, an extension that we can add to our Google Chrome browser from this link. Once we have added the extension to Chrome, the next thing we have to do to add Facebook events to our Google calendar is to open the browser and log in to our Facebook account. Once this is done, click on the option Events that is present in the menu on the left side of the Facebook homepage, in the Explore section. This will show us a page with all the events we have on Facebook, to which we have been invited, those that we have confirmed that we are going to attend or even those created by ourselves. From there, we have to click on the Facebook event that we want to add to the Google calendar. Then simply click on the Checker Plus for Google Calendar extension icon. This will open a window with a calendar and a pop-up window with the data of the selected Facebook event. 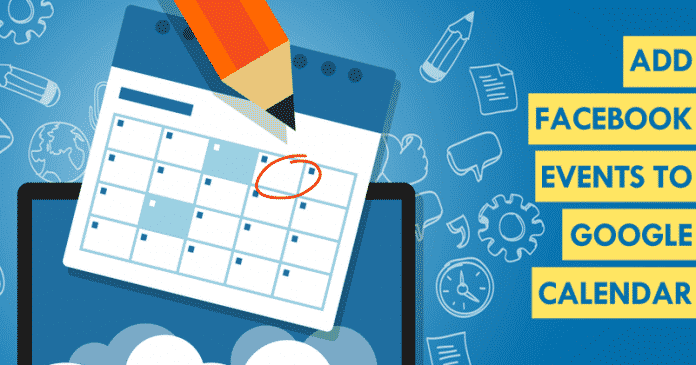 There we will see the name or title of the event, the date, time and a drop-down menu where we can choose if we want to add the event to the calendar of our Google account or any of the calendars that we have already created associated with our account. Now simply select what interests you and automatically the Facebook event will be added to your Google calendar. That’s it, now you are done. So, what do you think about this? Simply share all your views and thoughts in the comment section below. And if you liked this tutorial then simply do not forget to share this tutorial with your friends and family.